What originally started thousands of years ago in Central Asia has become a staple of winter camping, especially in the long, beautiful winters of Ontario. Yurts are a wooden structure covered with a tarp or canvas cover, and can be heated with a wood stove or electric heating. They offer the best true camping experience you can find in the dead of winter and luckily, Ontario is chock full of some incredible Winter yurt camping choices. Mew Lake is a beautiful campground open year-round, and offers seven yurts, all of which are available throughout the winter months. Each yurt can sleep up to six people, with two sets of bunk beds inside each. While it’s recommended that visitors bring their own bedding, a heavy winter sleeping bag isn’t necessary as Mew Lake yurts provide electric heat, equipped with fluorescent lighting and one electrical outlet per yurt. An outside barbeque and dishes are available only during the peak season, running from May 1st until Thanksgiving. The peaceful Mew Lake yurts are available for $97.18 per night. 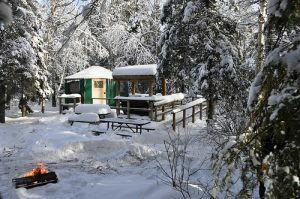 In true Algonquin fashion, there is a host of activities to be found when enjoying winter camping in Mew Lake’s yurts. If you get there early enough in the winter, the Old Railway Bike Trail – a 16.2 leisurely trail ride – culminates in a hike up the Track and Tower Trail and an amazing view of Algonquin Provincial Park. But once the snow begins to fall, Mew Lake becomes dominated by cross-country skiing. In total, there’s three networks of trails: The Fen Lake Ski Trail (consisting of four loops of 1.25, 5.2, 11.4 and 13 kilometres), the Minnesing Trail (a backcountry wilderness ski trail, also consisting of four loops ranging from 4.7 to 23.4 kilometres) and the Leaf Lake Trail – a trail famous for its serene views, with a wide variety of loops from 5 to 51 kilometres, for skiers with anywhere from little to a lifetime of experience! An incredibly diverse Provincial Park along the shores of Lake Huron, MacGregor Point boasts a loaded campground of 16 yurts, all of which are available year-round. Like Mew Lake, each yurt can sleep up to six people, with two sets of bunk beds. Winter camping is even more palatable in a cozy yurt and MacGregor Point’s yurts are just that; stocked with lighting, electrical heat and an outlet in each yurt. Although cooking is not permitted inside the yurts, a barbeque is available outside all through the winter. MacGregor Point yurts are available for $97.18 per night. Perhaps the most unique activity available at any of Ontario’s winter camping spots is the MacGregor Point ice trail. A 400-metre trail with a designated pad of ice on the side for hockey is perfect for a leisurely ice skate in the beautiful wilderness. From when the sun goes down until 10:00 PM, you can even enjoy a skate under the stars as the ice trail is lit by a string of trail lights. If skating isn’t your speed, the Deer Run Trail is an easy cross-country ski trail suitable for novices and families. Finally, Snowshoe trails are located in the Nipissing Campground and on any unplowed roads and trails! Windy Lake has an abbreviated winter camping period, with four yurts available starting January 5th and remaining open throughout the summer until September 4th. Equipped with two sets of bunk beds, lighting, electric heating and an outlet, the Windy Lake yurts sleep up to six. Although cooking is not permitted inside the yurts, each site has a deck, firepit, picnic table and a propane barbeque! Each yurt is available for the cost of $97.18 per night. Windy Lake Provincial Park partners with the Onaping Falls Nordic Ski Club to offer and maintain 15 kilometres of cross-country ski trails, beginning at the Ski Chalet inside the park. The Ski Chalet offers ski, boot and pole rentals, as well as a warm place to relax; stocked with wood stoves, seating and a snack bar, the Chalet is a perfect place to take a break. In addition to a host of cross-country ski options, there’s 8 kilometres of snowshoe trails throughout Windy Lake Provincial Park. With 10 yurts available during peak months, Silent Lake offers eight for winter camping, operating from December 8th to March 18th. The eight yurts have two sets of bunk beds and sleep six, but offer two different choices of heating. 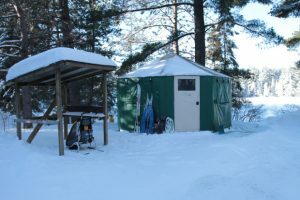 Four of the yurts available in the winter are heated with electric heating, while the other four are heated with a wood stove. Water and wood are provided, and each yurt has a table and chairs, as well as a barbeque and firepit outside. It’s recommended guests bring their own bedding, as well as cookware, dishes and lighting. 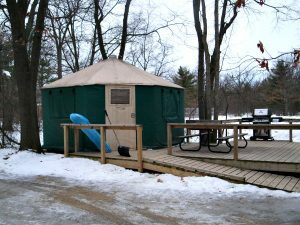 Each winter camping yurt is available for $97.18 per night. Four connecting cross-country ski loops dominate the activities at Silent Lake in the winter, with all four ranging in difficulty and length. Starting with the Green Loop (2.5-kilometre loop, for novices), Red Loop (6-kilometre loop, for novices), Yellow Loop (13-kilometre loop, moderate) and ending with the Blue Loop (19-kilometre loop, for experienced skiers), cross-country skiers of all ages and backgrounds can find a trail to enjoy. As an added perk for winter campers, Bonnie’s Pond Hiking Trail becomes a 3-kilometre snowshoe trail when winter arrives. 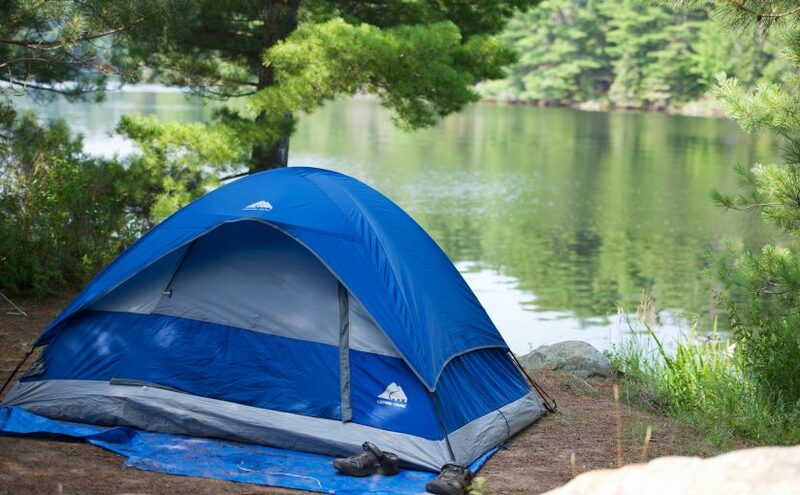 Pinery Provincial Park offers 12 yurts, all of which are available year-round. Like most yurts you find in Ontario, each one sleeps six with two bunk beds inside. A table and four chairs inside, a picnic table outside as well as a gas barbeque and firepit, winter camping is made easy and comfortable here. Each yurt has electric heating inside, and flush toilets, showers and laundry are nearby. It’s recommended visitors provide their own bedding, cookware and dishes. Yurts are available for $97.18 per night. Famous for it’s cross-country skiing, the amazing Pinery Provincial Park boasts 38 kilometres of trails that form a series of loops. The incredible series of trails can accommodate skiers that are out for their first time or even the most experienced cross-country skiers! 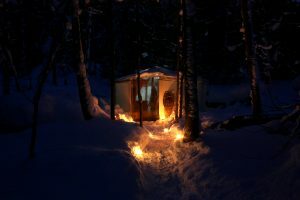 The most glamorous of winter camping options, Atelier Arboreal offers four yurts, with an unique all-inclusive experience. With a winter season running from December 15th to May 15th, a sauna and outdoor living room are just two of the fascinatingly unique features of Atelier Arboreal. Wood-heated and able to accommodate up to five adults, these yurts are available for $349 per night (on a two-person basis), with an additional $125 per adult added. Other packages are available for groups. Not short on activities, Atelier Arboreal offers guided trips of the Bruce Peninsula, cave and cliff exploring, snowshoeing and skiing! On weekdays – if conditions are safe – ice fishing is even a possibility. In the surrounding area, you can find the Sawmill Ski Trail, Dual Acres Horse Drawn Sleigh and Wagon rides, and even ski-doo for rent! Ideal for a romantic getaway, a family vacation or even a Scouting trip, Atelier Arboreal is a stunning winter camping option. Minaki Yurt Adventures offers four distinct yurts, all of which are open year-round. There’s the Blueberry Yurt, a four-person yurt – with cots available if you have extra guests – that has a stocked kitchen, a propane stove, with a dining area and fire pit outside. 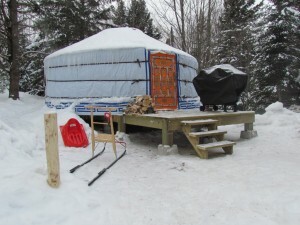 The Blueberry Yurt is heated with a wood stove and is available for $110 per night. Next, the Fireside Yurt is a four-person yurt with a queen size bed and a queen size sleeping mat. It comes with a stocked kitchen, a two-burner propane stove, a coffee and dining table and a wood stove. Water and wood are provided. The Fireside Yurt is available for $125 per night. The Lakeside Yurt is a two-person yurt with just a queen size bed inside for sleeping. It comes equipped with a fully stocked kitchen, wood and propane stoves, with water and wood being provided. The Lakeside Yurt is available for $110 per night. Finally, the Trailside Yurt can sleep up to 11 – with three double beds and five single beds – though it’s recommended you bring your own bedding. The Trailside Yurt has a stocked kitchen, a propane stove, while wood and water are provided. This large yurt is available for $150 per night, or $27.50 per person per night, whichever figure is greater. Whether you’re with a large group or your special other, there’s great activities to be had. You can ice skate on the lake as it freezes over in the winter. Additionally, each yurt is located along 20 kilometres of trails that are perfect for snowshoeing or cross-country skiing. Nature’s Harmony offers a traditional Mongolian yurt that sleeps four, with a double bed and a futon inside. All the kitchen necessities are provided, in addition to water and wood. The yurts are heated by a wood stove, and you can find a barbeque just outside. Overflowing with your choice of activities, Nature’s Harmony has kick-sleds and snowshoes available to rent. Other activities include tube tobogganing, cross-country skiing and pond skating. The activities are free for guests, and there are miles of trails surrounding the park to be explored by ski or by snowshoe. The Mongolian yurt is available for $85 per night on a per person basis, with an additional $25 charge per extra adult. The beautiful yurta, available year-round, can sleep 2-4 people with a double bed and a futon found inside. The yurta comes with a stocked kitchen and a mini fridge inside, while a barbeque, picnic tables and a firepit can be found outside on your own private deck. The yurta has private lake access for the most serene views. A secluded, self-sustaining area, the Washagami Landing yurta is in a spot along Lake Washagami where there isn’t much winter activities, save for one incredibly unique one. Just steps from your private view of the lake, the water moves slow enough to freeze over in the winter, affording visitors the amazing experience of ice skating on the beautiful Lake Washagami. The Washagami Landing yurta is available on a minimum two-night-stay basis, at $120 per night for unheated or $155 per night for heated. Are there yurts in Cypress Lake on the Bruce Peninsula? Yes, there is a yurt camping facility at Bruce Peninsula National Park but they are not open for Winter. This article focuses only on yurts that are open for Winter. Is this all the winter yurt camping in and around southern Ontario? I’m in Toronto. Which place in your opinion has the best quality yurts that provide the best “indoor” experience? I can imagine some yurts being in not great shape. This is kind of the same question, but, which “setups” were the best? Meaning, everything in total, Yurt, deck, bbq, washrooms, fireplace, everything combined among the “standard” yurts? I am looking for Yurt/ camping for 12 people, for any weekend in Jan or Feb. Could you please let me know which one is available. Thanks.